Lenovo ThinkVision T2220 21.5 inch Widescreen Full HD LED Monitor Response 5 ms. The ThinkVision T2220 21.5-inch WLED Backlit LCD Monitor meets all users' functional needs in both work and home environments. The WLED backlit panel with wide screen 1920 x 1080 resolution provides full-HD quality to customers. Its popular 16:9 aspect is increasingly becoming standard in the market. With built-in VGA + DVI interfaces and tiltable stand, it offers a comfortable usage experience. Compatible with Windows 7, Windows 8 and Windows 8.1, allowing more flexible usage. In addition, it is environmentally conscious, meeting the latest green standards including US Energy Star 6.0 Certified, TCO 6.0, China Energy Standard Tier1, EPEAT Gold Certification and VOC test. 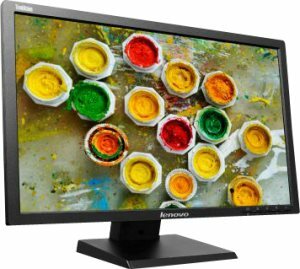 The ThinkVision T2220 21.5-inch WLED backlit LCD monitor provides meets users all functional needs in both work and home environments. It adopts WLED backlit panel, with wide screen of 1920 x 1080 full resolution pixels, which provides high HD qualification to customers. Its 16:9 aspect is standing for the increasingly popular trend. With built-in VGA + DVI interfaces and tiltable stand, it offers users comfortable usage experience. In addition, it is environmentally conscious, meeting the green standards including ENERGY STAR 6.0 Certified, TCO 6.0 China Energy Standard Tier1, EPEAT Gold Certification, VOC test. 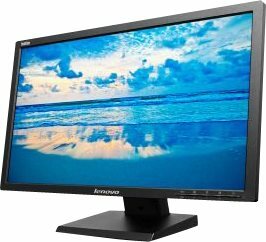 Lenovo ThinkVision T2220 - LED monitor - 21.5"